Ah-ha! Bet you thought I was gone, eh? Never to return to Tartlandia or my beloved Queen and comrades? Well, if you thought that, then you’d be wrong. Everyone who didn’t think that, I applaud your loyalty, ’tis truly heartwarming. (That is to say, if I, the Baron, have a heart. Being a Baron, even of books, is a tough job. Sometimes heartlessness is required. Ask me about the heart-eating Wyverns that plagued a Barnes and Noble, sometime. It’s quite a tale). Anyways . . . .I went into this book with only the knowledge that it was some sort of psychological thriller. 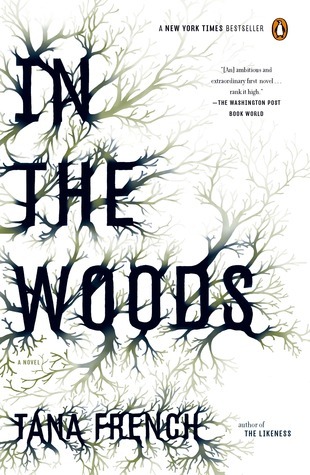 In The Woods focuses on Irish detective Rob Ryan and his partner Cassie Maddox, an unconventional and extremely endearing pair of most definitely messed up people. (Really, messed up people are the best, because if you get out of this life in a vaguely normal fashion, you probably missed something somewhere). The book is told from Rob’s point of view, and it gives a wonderfully complex look into his mind. The synopsis gives a helpful hint of the book, in that twenty years prior, when Rob was only twelve years old, he and his two best friends went off into the wood near their tiny town of Knocknaree, as they were apt to do. They did not come home, however. A dedicated search party would find only the young Adam Robert Ryan, his back pressed against a tree, fingernails digging into the bark, blood on his shoes. He had no recollection of what had happened to his two best friends. No trace of either was ever found. Fast-forward twenty years to 2004, Adam Ryan switched to his middle name (hence the Rob Ryan) in an effort to avoid the publicity that had come with such a case as his. Three children missing in 1984 in a small Irish town, only one ever found? The story had swept the country. Rob did not, as you might think, go on to become a detective in some attempt to solve his own case. He explains his reasoning quite plainly in the first chapter, mentioning a time when he observed two murder detectives talking amongst themselves on how to deal with a case, observing their careful planning on how to make a suspect crack. Now 2004, Rob is a detective on the Murder Squad, his partner the only female detective in their unit. And let me make this abundantly clear, the interactions between Rob and Cassie are one of the absolute highlights of this book. Their relationship doesn’t exactly defy expectations (half the squad thinks they’re sleeping with each other, which they are not), so much as go on to prove that such expectations are clearly shallow. Their friendship is a beautiful, fiery thing, and watching them at work in the book was truly a pleasure. However, it is put to the test when they land a case involving a young murdered girl. And wouldn’tcha know it, its in Knocknaree, Rob’s old town. Things immediately get dicey, Rob hasn’t told many people about his past, Cassie being one of the few. After viewing the crime scene, which happens to be an archeology dig in had once been the very same wood he and his friends had disappeared in, it rings in their heads that perhaps they should tell their Superintendent that Rob was centrally involved in a case that had happened in the very same area. Something, though, clicks on Rob’s mind, and he holds off. From there on, the pair try to solve the case of a murdered little girl, dodging into conspiracy territory and even a bit of politics, hunting for the elusive killer and even more elusive motive. And again, what I remember most fondly is the interactions between Rob and Cassie. The two have a pleasant, snarky back-and-forth in both public and private. Interviewing suspects is a definite act of theatre, and the pair of them are admirably good at it, sliding questions into the conversation in-between chatting about what sort of pizza to order. “Go on, have some. You should keep your strength up; we’re going to be here for a while.” Pizza rarely sounds terrifying, but when Rob and Cassie use it as a weapon, it certainly takes on that aura. Now I must confess, I actually found this book a bit hard to get through. The characters are messed up, traumatized and most definitely gave me the urge to strangle them once or twice as I couldn’t understand some of their decisions. But then, I think, that’s a good thing. Because if I cared enough to get angry when I saw them screw up . . . well, it’s a fair bet I was into the book up to my neck, then. What else can I say? Good book, worth the time, give it a read? As dusk approaches a small Dublin suburb in the summer of 1984, mothers begin to call their children home. But on this warm evening, three children do not return from the dark and silent woods. When the police arrive, they find only one of the children gripping a tree trunk in terror, wearing blood-filled sneakers, and unable to recall a single detail of the previous hours. Twenty years later, the found boy, Rob Ryan, is a detective on the Dublin Murder Squad and keeps his past a secret. But when a twelve-year-old girl is found murdered in the same woods, he and Detective Cassie Maddox—his partner and closest friend—find themselves investigating a case chillingly similar to the previous unsolved mystery. Now, with only snippets of long-buried memories to guide him, Ryan has the chance to uncover both the mystery of the case before him and that of his own shadowy past. Richly atmospheric, stunning in its complexity, and utterly convincing and surprising to the end, In the Woods is sure to enthrall fans of Mystic River and The Lovely Bones. And look for French’s new mystery, Broken Harbor, for more of the Dublin Murder Squad.